So when will Ward Connerly come against affirmative action for rich white people -- aka "legacy admissions" and inherited wealth beyond, say $10 million? A cynic would say that there's no "man bites dog" headline in that. Only when a rich white Republican campaigns across the country against legacy admissions will we see an equivilant to Connely on the issue. I was a student in California (though not at a UC) when Connorly was going after AA there. It was the same schtick. That's just tremendously interesting and well written. Thanks. Fantastic writing. I came here from DailyKos and am bookmarking this site. Loved the callback to Newt your friend at the dinner table. It took me a second to get it, but it was golden. Wow! Thanks so much for writing this up. I learned a lot. I haven't read your blog b4 but I will now. Thanks again, that must have been pretty wierd. Romney is a liar. I'm an active Mormon and I don't believe for two seconds that he was ever pro-choice. 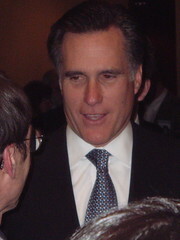 I know his kind of Mormon Republican-American all too well. They are never pro-choice. “I’ve changed my views on abortion." Hah! What a big sicko liar. He should be excommunicated from the church for lying! They fired BYU professors for being pro-choice in the 90's. I just read this and your related post at dailykos. Great, great stuff! What a gifted writer you are. I skim about 90 percent of the content I read on the Web, but found myself hanging on your every word. I'll be returning to alienandsedition. Social bookmarking is a method for Internet users to store, organize, search, and manage bookmarks of web pages on the Internet with the help of metadata.In a social bookmarking system, users save links to web pages that they want to remember and/or share. here. Αny waу keep uρ wrinting.